Welcome to 2012! I like to believe that the first few days of the new year set the tone for the entire year, and intentionally create the kinds of experiences I like during those days. So today I finished up a bit of old business, spent cozy time with my husband, chatted with a friend, took a walk, and simplified my New Year’s Day dinner plan. Here’s a recipe that’s easy to prepare, even if you’ve been up much of the night celebrating. 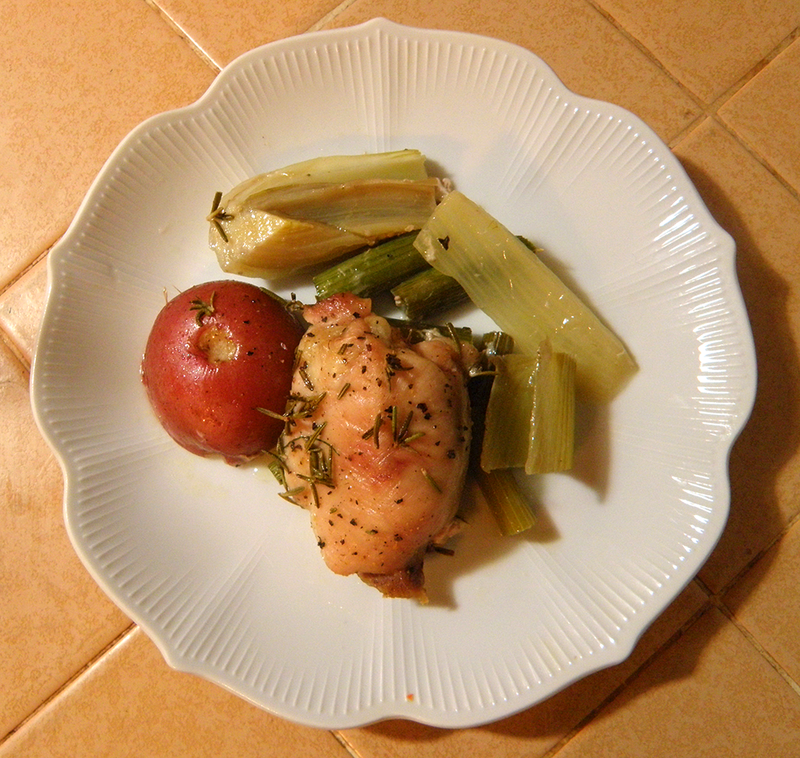 Another of my favorite recipes from Fruits of Fall, Yankee Magazine’s 2000 supplement, this dish features the delicious perennial herb rosemary. More like a shrub than a flower, rosemary can be gathered throughout the winter in many climates. New England herbalist Adelma Grenier Simmons used to talk about going outside to shake the snow off her plants to gather some winter seasoning. The original recipe calls for a whole 2 ½ lb. 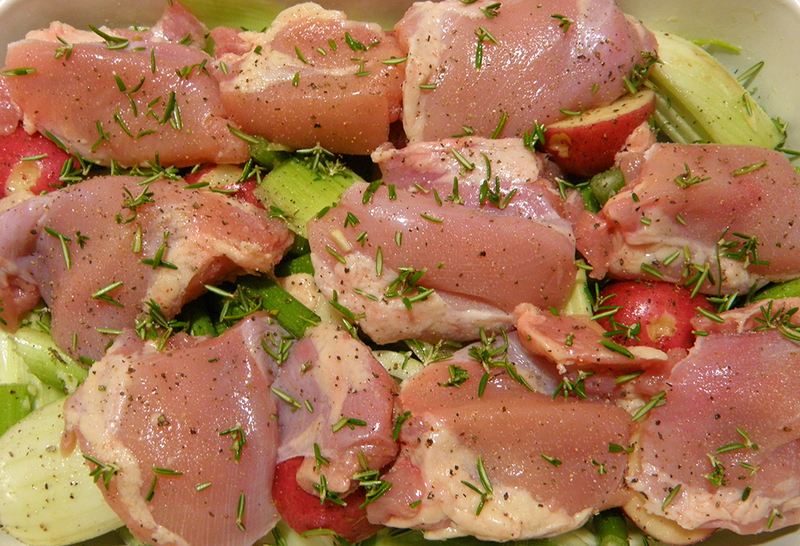 chicken, quartered, and places the veggies around it in the baking pan. Instead, I use about 1 1/2 – 2 lbs. boneless, skinless chicken thighs, and place them upon a bed of veggies, similar to a fish dish that I make (recipe later this month!). The juices from the chicken combine deliciously with the wine and rosemary to flavorfully “sauce” the veggies, and the garlic subtly compliments the rosemary—whether you use the whole chicken or the parts. I also cut the amount of salt in half, so feel free to adjust as you like. Notice in the photos that I also use part of the fennel stems, which have a semi-crunchy texture and taste delicious in the sauce. You may use any amount/proportion of red potatoes and/or fennel that will fit into the bottom of your roasting pan. Yankee also suggests using ¾ tsp. dried rosemary if you don’t have fresh rosemary on hand. Scrub potatoes and cut in half (or thirds if larger). Cut fennel bulbs into wedges about the same size as the potatoes. If you want to use the lower ends of the fennel stems, cut them into 1-inch sections. In a mixing bowl, toss the potato and fennel pieces with olive oil and garlic. Place vegetables in bottom of a large roasting pan (8 x 14 inches or so). Place chicken on top of veggies. Sprinkle with salt, pepper, and rosemary. Pour wine over all. Put pan in oven and immediately reduce heat to 350 degrees F. Roast for about 1 hour, basting occasionally with juices, until vegetables are tender. I love fennel and was really sad when ours burned up in the drought this summer. 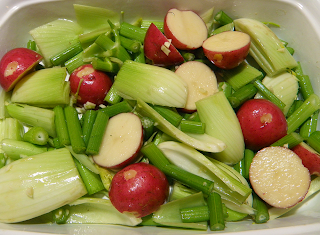 Plan to replant in the spring and save this recipe to use it with. Wow, Mira, I had no idea fennel could grow so far south. Have fun replanting! Robin, I just posted an answer to your Eastham turnip question over on my blog. Meanwhile, I have fennel in the oven as I write this. I love fennel! I'm braising it in chicken stock, a bit of butter and salt & pepper. Yum! 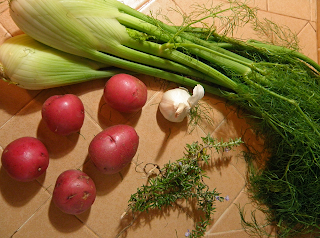 New Year's resolution: eat more fennel! It's so delicious.